Given that I have loads of work to do, I’ve become a coffee addict again. A persistent cold also helped, as I’m quite incapable of going through a day’s work without lots of caffeine when my throat, temples, forehead and eyes hurt, my nose and chest are congested, and my bones feel very tired. So I started drinking coffee again, as green tea wasn’t enough anymore. 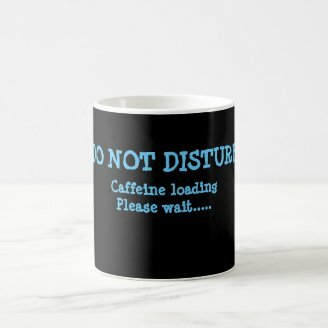 As I also make some quote coffee mugs on Zazzle, I started reading more about coffee, and my enjoyment of this wonderful drink increased. I also felt tempted again to spend money on good coffee in town. Yesterday I went to a nice French pastry shop we have here in Bucharest and treated myself to a tasty, creamy espresso. As it was late in the evening, I told the girl to make it decaf. I’m quite sure she gave me a proper espresso, caffeine and all, because I couldn’t fall asleep at the expected time last night. Which means I’ll be drinking lots of coffee today, too. And so the cycle continues. I have become a coffee addict again. With all this in mind, I have decided to post this article for those looking for fun gifts to give to coffee lovers and coffee addicts. 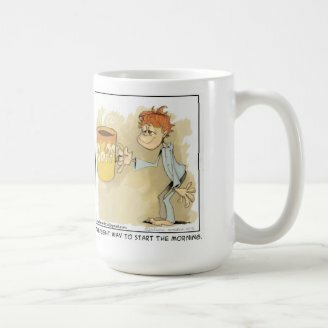 I won’t cover all types of gifts – only quote mugs, since that’s where my main interest lies at the moment, as I am designing such mugs on Zazzle and enjoying it greatly. It’s quite an arduous journey, since a lot of great ideas for coffee mugs with quotes are taken. 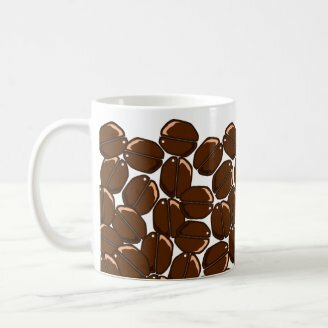 I’ll show you some of the best Zazzle designs on the theme of coffee addiction – and then I’ll also show you some of my own. There are many designs with the “Caffeinating . . . 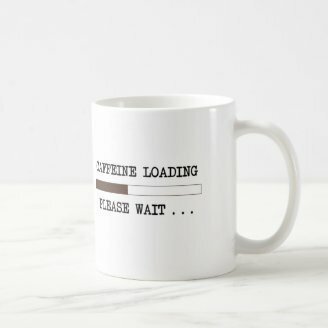 Please wait” or “Caffeine loading . . . Please wait” message. There are also many wordier versions on this design, of the “Don’t speak / You may speak / Actual conversation now possible” // “Shhh / Almost / Now you can speak” // etc. type, but one of the best ideas around this caffeine loading concept has no words at all. It’s simply a loading icon from the world of computing. I’m showing it, even as it’s a mug with no quotes, because I think it’s such a powerful design idea. At the other side of the spectrum, I made a mug with lots of talking. Hope it has value as well. I certainly enjoyed creating it. It’s about an imaginary conversation taking place in a house with two parents of two or more children, a house where in the morning the parents are quite groggy and overwhelmed by the many tasks they have to do in a very short time, before they even have the chance to wake up properly. One parent is also more adept at dealing with the whole morning business than the other. The scene in my head was rather powerful, so I found myself making this 'You may not talk yet"-style mug, which includes actual dialogue. The “Instant Human. Just add coffee” quote is another one of my favorites. It comes in many shapes, so look on Zazzle for the design that pleases you the best. I chose this one because it appealed to me a lot, but you may prefer another visual expression of this quote. Also remember that you can choose the type and size of the mug. 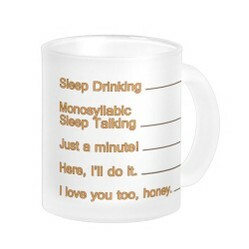 You can also add a name on the mug, for instance, if you want to give this mug to someone who may enjoy the humor. Note that if you do write a name, it doesn’t have to be under the image you see right now on the mug. You can add it on the other side of the mug, by moving it with arrows until it gets there. You can also place the name vertically, if you’d like to. A version of the “Instant Human. 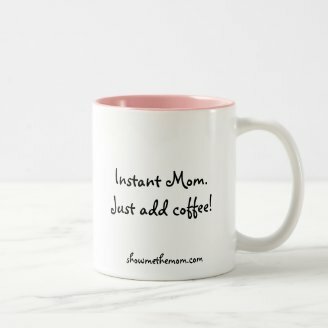 Just add coffee” quote is “Instant Mom. Just add coffee.” I think it would make a fun gift for mothers of young children. So if you’re stumped for ideas for Mother’s Day, here’s one (shown below). 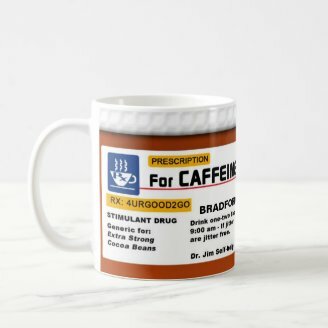 Then there are lots of caffeine prescription mugs out there, which you can, of course, personalize by replacing the name on the template with your name -- or the recipient’s name, if you plan to gift it to someone. The mug I’m showing you has a prescription for caffeine jitters, which reads, “Drink one-two 8 oz. cup/s of coffee before 9:00 am – If jitters continue – repeat until you are jitter free.” This prescription-humor idea is rather old, but it still has its appeal – any of us can think of people who would enjoy it. Another old idea is “I drink coffee for your protection” – but, like the prescription design, this, too, stood the test of time. There are various incarnations on Zazzle. One I like better than others comes on a travel mug. 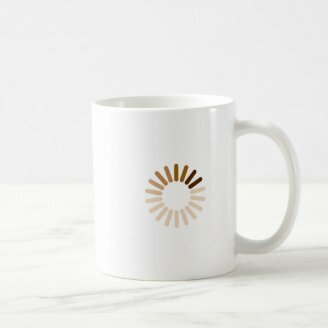 As with all mugs shown, remember you can choose the type of mug you want your design on -- and that you can buy it as is or personalize it with a name. Some designers can really draw, so some quote mugs have nice illustrations. I’m showing one of my favorite ones to the right. It includes a large coffee mug with the word “Coffee” and the text “The right way to start the morning.” It’s a rather cute mug and it works best on larger-size, 15 oz mugs, of course. Note that the design is available on other products as well: notebooks, canvas totes, ceramic tiles, etc. The designer is very talented, so you may want to check out his store for other illustrations as well (just click on his name under About the Design once you’re on Z.). Finally, I’m showing two mugs without quotes. The first one simply shows coffee beans. I actually wanted to show another mug, with a photo, but can't find it on Z. anymore. It had the right colors and blurs, and wraps around the mug nicely. Anyway, it could be an idea for you, if you’re looking into making mugs on Zazzle. Also, if you search on Z. you will find more coffee bean mugs, with both photos and illustration images. 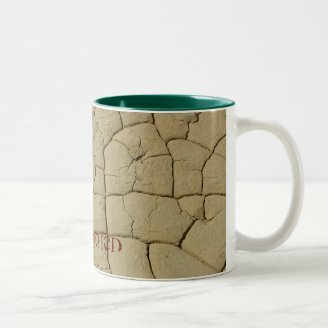 The other mug shows cracked mud. And easy photo to convey a powerful idea. and found some coffee mugs you liked! Pinned instead to my new Zazzle gift board. Coffee lovers will find some fun and humorous mugs to give their friends on this page. I love these coffee mugs. I can't talk straight without at least two cups. I just gave you a mention on my Google+ page. I think these are great Mother's day Gifts.